Waterproofing has always been one of the most basic needs for all buildings and early failures can cause many tangible and intangible losses to the owners. In some cases, catastrophic failures can also occur due to improper systems applied to the critical areas. In Sto, we always believe in the importance of doing it right the first time. Restoring a building to its former glory after the damages caused by waterproofing failures can be very stressful and time consuming in most cases. Our waterproofing materials and systems have been designed to cater for various situations and designs in order to adapt to the needs of the market and our environment. Over the years, we have strive to provide the best solutions to our clients through our active involvements in both the design and execution stage of waterproofing works. You will have a peaceful mind knowing that your most valuable assets and investments are in safe hands when Sto is involved. 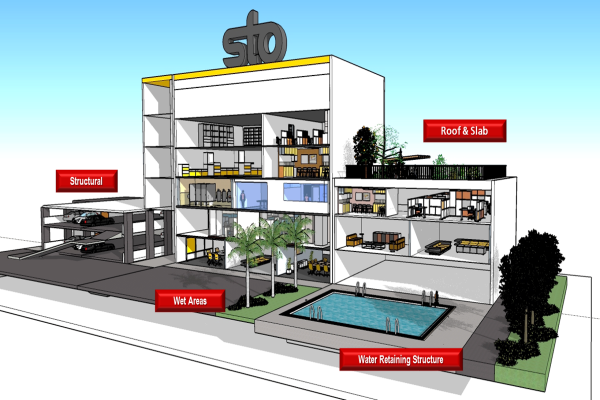 Sto provides a wide range of waterproofing products to suit every applications.